The Detroit Red Wings agreed to terms with defenseman Jakub Kindl on a four-year contract on Friday. As per club policy financial terms were not announced, however the deal is reportedly worth $9.6 million for an annual salary cap hit of $2.4 million. His previous salary was $1.05 million. Kindl, coming off a breakthrough season that saw him solidify a role on the Detroit blue line, was set to become a restricted free agent on July 5. Appearing in 41 of the Red Wings’ 48 games this season, Kindl scored 13 points and was a +15 – good for second on the team behind Pavel Datsyuk. He played in all 14 of the team’s playoff games, adding five more points while going +4. Kindl was Detroit’s first-round selection in the post-lockout 2005 NHL Entry Draft, where the Red Wings selected 19th overall. With Kindl signed, the Red Wings have approximately $8.2 million in salary cap space remaining for the 2013-14 season. Restricted free agents Brendan Smith, Joakim Andersson and Gustav Nyquist are expected to return while unrestricted free agents Valtteri Filppula, Damien Brunner and Daniel Cleary are less certain. Unrestricted free agent defenseman Ian White will not be back with the club. The Detroit Red Wings revealed their 2013 preseason exhibition schedule on Tuesday. As per recent tradition, the team will play eight games split up into four sets of home and road matchups beginning September 16. The Red Wings will visit the Pittsburgh Penguins, Chicago Blackhawks and Boston Bruins before hosting the Bruins in the back end of a home-and-home, then hosting the Blackhawks and the Penguins. They’ll close out the preseason with a home-and-home against the Toronto Maple Leafs, with the final exhibition on September 28 in Toronto. Have heard from multiple GMs this week they don’t like the compliance buyouts. If you haven’t made a mistake, they’re of no use to you. The Red Wings are expected to use at least one of their buyouts this summer. They may save another for next summer, they may not. Names commonly suggested as buyout candidates? Mikael Samuelsson. Jordin Tootoo. Carlo Colaiacovo. Yeah, the team would rather trade Tootoo and/or Colaiacovo if they can but that those three names – and almost exclusively those three names – are the team’s buyout candidates shines a harsh light on general manager Ken Holland‘s efforts in the summer of 2012. Samuelsson and Tootoo – along with oft-forgotten backup goalie Jonas Gustavsson – were Holland’s July 1 free agent signings. Colaiacovo was all Holland could get to shore up the team’s blue line after the Red Wings were spurned by Ryan Suter, signed just days before the start of the lockout that wiped out the first half of the 2012-13 season. Three of Holland’s four signings from less than a year ago are candidates to be jettisoned when the league’s buyout period begins late Wednesday night. If you don’t need a buyout if you haven’t made a mistake, clearly needing one means you did make a mistake. Seventy-five percent of Holland’s signings from last year ago are appearing to be mistakes, in fact (and the remainder is almost a non-entity). I’m not saying he should be fired for that effort, I’m not even saying this is a trend. Holland has built Stanley Cup winners in both the pre- and post-cap eras and the team wasn’t expected to compete last season anyway. However, if you can look at the results of a summer just a year later and say that many of the team’s signings were mistakes, you have to recognize that 2012 has to go down as his worst summer as general manager of the Red Wings. Plans for the mixed-use development to be anchored by a new arena for the Detroit Red Wings were announced on Wednesday as the Downtown Development Authority approved a financing plan for the project. A non-binding Memorandum of Understanding was agreed to by the DDA, Olympia Development and Wayne County, detailing the responsibilities for financing and management of the development, to be bounded by Woodward Ave. to the East, Temple St. to the North, Cass Ave. to the West and I-75 to the South. The 18,000-seat successor to Joe Louis Arena would be the cornerstone of the development. The DDA would own the arena while Olympia would operate it. A similar agreement is in place for Joe Louis Arena. The $650 million price tag for the development is expected to be covered by a public/private split. $365.5 million will be covered by private funds with the rest coming from public sources. The City of Detroit will put no money toward the project. The Grand Rapids Griffins claimed their first-ever Calder Cup Championship on Tuesday night, defeating the Syracuse Crunch 5-2 to complete a 4-2 series win. Forward Tomas Tatar was named the Most Valuable Player of the playoffs. He scored twice in the final game for a total of 16 goals and five assists for 21 points in 24 playoffs. Richard Panik opened the game’s scoring with 2:45 remaining in the opening period, jamming a rebound chance past Petr Mrazek with the Grand Rapids netminder out of position. The Griffins tied things back up at 2:23 of the second when Mitch Callahan whacked a shot from the inside edge of the right faceoff circle past Syracuse goalie Cedrick Desjardins. Tatar’s first of the night put the Griffins up with 7:19 remaining in the middle frame. On a Grand Rapids power play, Tatar found open space on the far side of the crease and banged the rebound of a Gustav Nyquist chance past Desjardins. Andrej Sustr would pull the Crunch back into a tie at 5:14 of the third but Brennan Evans snuck a shot from the left point through traffic and past Desjardins at 9:54 for the eventual game-winner. Tatar and Joakim Andersson each added late-game empty-net goals to confirm the victory. Hours after his agent revealed that Pavel Datsyuk was close to coming to terms on a contract extension with the Detroit Red Wings, Datsyuk himself confirmed that the two sides had agreed to a three-year deal. “Signed 3 yr. extension. Detroit, glad to be here for 4 more yrs.Thanks to our fans, friends and Ilitch family.” Datsyuk tweeted. The deal, which would keep Datsyuk in Detroit through the 2016-17 season, can’t actually be signed until July 5, per NHL rules that prevent players from signing contract extensions until the last year of their existing contract begins. Datsyuk had previously stated that he would like to end his career in Russia’s Kontinental Hockey League, casting doubt on the possibility of him remaining with the Red Wings past next summer. He will turn 39 the summer his new contract expires, meaning this could be his final NHL contract. In the lockout-shortened 2013 season, Datsyuk was Detroit’s leading scorer with 15 goals and 49 points. He added nine points in the playoffs. As per club policy, financial terms of the deal were not formally announced. However, reports state that the contract will be worth $22.5 million for a salary cap hit of $7.5 million. Datsyuk made $6.7 million annually over the seven-year term of his previous contract. The Grand Rapids Griffins being in the American Hockey League’s Calder Cup Finals has inspired a couple different small discussions on Twitter about the differences between that league’s two conferences. Early last week I had an exchange with Matt Saler of On the Wings when he asked “How do the Crunch get away with such a small arena?” upon seeing that War Memorial in Syracuse doesn’t have regulation-sized ice. I responded with a generalization about the AHL Eastern Conference being made up of old markets where they can’t be bothered to renovate old arenas. Then last night I had a short exchange with George Malik about what might have happened if the Vancouver Canucks had been able to relocate the Peoria Rivermen to Seattle, as they attempted to do before eventually settling on Utica, NY. George commented that travel to Abbotsford and Iowa would be good for the Seattle team and I countered saying that, aside from Abbotsford, Seattle’s closest rival would be further than any Eastern Conference’s team furthest rival. My thought was that the Western Conference is generally made up of the IHL refugees and teams that play second-fiddle in NBA arenas. Teams that play in newer, larger arenas in markets that haven’t had higher-level hockey for as long. The Eastern Conference, meanwhile, is it’s own private bus league (within a bus league), made up of older, smaller markets in older, smaller arenas. That assumption seems to be proven true by the numbers but it’s closer than I would have thought in some cases. The average construction date of a Western Conference arena is 1991 compared to 1983 in the Eastern Conference. More telling, perhaps, is that the Eastern Conference has eight of 15 arenas that were built prior to 1980 while the Western Conference has only two. Those newer Western Conference arenas seat an average of 12,734 compared to only 9,033 in the Eastern Conference. On top of that, all five of the AHL’s teams that play in NBA arenas are in the Western Conference. I was surprised to see that the teams of the Western Conference were, on average, founded in 1998, only two years later than the 1996 average for the Eastern Conference. However, the Eastern Conference’s markets have, on average, been served by high-level hockey leagues since 1972 while the Western Conference markets have only been in use since 1985. The bus-league dynamic of the Eastern Conference is undeniable, however. Of the 15 teams, only two are more than 100 miles away from their closest rival compared to seven in the Western Conference. The average distance to an Eastern Conference team’s closest competition is 119 miles, skewed by the 888-mile trip from St. John’s to Portland. The average distance to a Western Conference team’s closest opponent is 216 miles, with the 1,563-mile trip from Abbotsford to Oklahoma City as the largest outlier. Additionally, no Eastern Conference team’s closest rival is in the Western Conference while two Western Conference teams (Rochester and Charlotte) are closer to an Eastern Conference team than anyone else (Syracuse and Norfolk, respectively). For the record, if you remove the outliers of St. John’s and Abbotsford, the average distance to the closest rival in the East drops to 64 miles while dropping to 119 in the West. Disclaimer: There were a few assumptions I made when compiling this data. One is that I used each arena’s max capacity for hockey, so if a team uses curtains to block off sections I didn’t account for that. The thinking being that they still play in a big arena, whether they use it all or not. Another is that “higher-level hockey” is defined as AHL, IHL, WHA or NHL. In the case of Chicago and Toronto, I ignored the Blackhawks and Maple Leafs because, unlike markets like Hartford, their AHL teams aren’t meant to be replacements for the NHL clubs. Also, I used the 2012-13 AHL alignment that includes Peoria and Houston because, while we know those teams will be replaced by Des Moines and Utica, we don’t know what the league’s alignment will be to accommodate that. 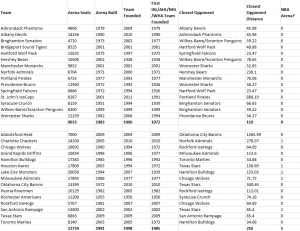 I determined a team’s year of founding by when a franchise began play in its current market, with IHL refugee teams counting for when they began play in the IHL. The National Hockey League announced on Friday that Detroit Red Wings forward Henrik Zetterberg was awarded the NHL Foundation Player Award for the 2013 season. Zetterberg received the award for his work locally in Metro Detroit and for international efforts in Ethiopia, Guatemala and Nepal. In Detroit, Zetterberg serves as the team spokesman for the Red Wings’ annual Smoke Detector Collection and personally matches all donations to the fund. In Ethiopia, Zetterberg and his wife, Emma, build the Chige Primary School in Kemba with Action Aid Ethiopia. He also funded an addition to the Belta Telo Middle School that will help it double in size. The Zetterbergs also support programs n Ethiopia and Guatemala that allow participants to work themselves out of poverty. The Zetterberg Foundation has financed and built six houses in Nepal for former debt slaves. Zetterberg joins Darren McCarty as the only Red Wings to have been given the NHL Foundation Player Award. Detroit is just the second team to have had two winners, joining the Buffalo Sabres. Pavel Datsyuk finished third in voting for the Frank J. Selke Trophy as the league’s best defensive forward. Chicago’s Jonathan Toews won the award, edging out Boston’s Patrice Bergeron. As first reported by Josh Rimer, the Detroit Red Wings have signed forward Drew Miller to a three-year contract extension. Miller, 29, had been set to become an unrestricted free agent on July 5. Originally drafted by the then-Mighty Ducks of Anaheim in 2003, he has spent the past four seasons with the Red Wings after having been claimed on waivers from the Tampa Bay Lightning in 2009. In 44 games this season, Miller had four goals and four assists. He broke his hand with four games remaining in the season but returned for Game Two of Detroit’s second-round matchup with the Chicago Blackhawks. The deal is reportedly for $1.35 million per season, a raise over his $837,500 cap hit on his previous two-year contract. 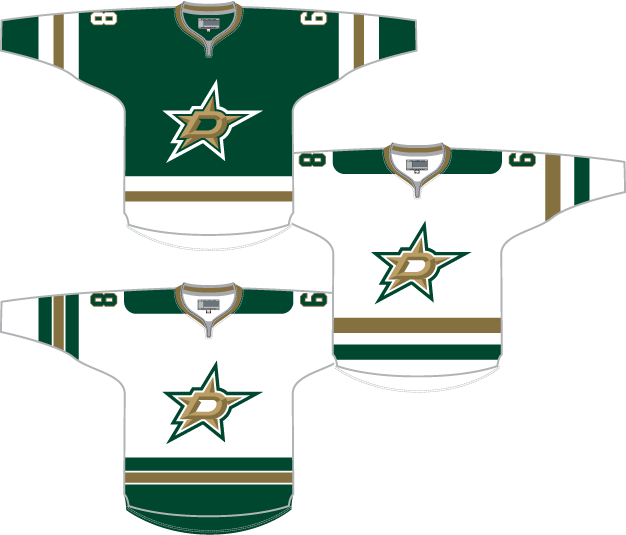 Since I wrote in January about the then-upcoming new logos and jerseys for the Dallas Stars, I figured I’d put something together now that they’ve been revealed. Personally, I’m not a fan. The logo screams “arena football” to me and the fact that black was kept in the color scheme but gold was removed is disappointing. I don’t love the change to “victory green” or whatever their calling the new primary color but I loved their old green, so whatever. I look at the new jerseys and I just see North Dakota. The entire identity seems derivative. That said, I think they could have gone with some of the changes had they only kept the colors the same. Had they dropped black, kept gold, and kept their previous green I think this set might have worked. The first two are a simple palate-swap of their new jerseys, with gold replacing black in the striping pattern and grey removed. The third sees the light jersey based more on the dark jersey. I removed the shoulder logo because I hate it. I could see the new pant logo (recolored of course) working as a shoulder logo but I also think the shoulders can be left blank. As with my previous concepts, my template is a little flawed so the collar isn’t displayed quite right. I’d expect the lace-up collars actually unveiled tonight to be used. I was also lazy and kept Jaromir Jagr‘s #68 on the mock-up from my previous design. It doesn’t mean anything. I don’t entirely love these designs but I like them more than what the Stars actually went with. Not that it means anything.